protects surfaces from dents and scratches. Each piece also comes with zinc-plated weight horns that hold a wide range of plates, trumpet horn molded nylon racking pegs and molded rubber foot pads to add stability and protect floors. 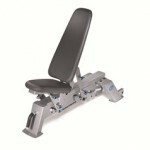 Functional design on bent steel frames is highly adjustable and adaptable to the user’s individual workout requirements. “On board” plate storage maximizes floor space without compromising durability. Asthetically pleasing, modern ergonomic design and structural integrity are ensured by highest-grade machined parts and 11-gauge frame tubes.